Gobi Arts and Science College was stared in the year 1968 and offers eighteen undergraduate courses, sixteen postgraduate programmes, M.Phil and Ph.D. programmes. The college aims to serve the society with humility and trust and to impart value based higher education, particularly to the socially and economically deprived sections. The College issues Prospectus separately for Aided courses and unaided courses every academic year. The Prospectus contains rules and regulations as laid down by the State Government and the affiliating University. For MCA course, the admission for all seats is done through the counseling conducted by the Government of Tamilnadu and based on the marks obtained in TANCET. A list of eligible students is prepared and a Single Window System is followed for the selection of the students. College provides well designed, fully equipped, modern and spacious classrooms, IT centre, labs, library, cafeteria with a warm and cozy atmosphere, students clubs and many other facilities for students to spend their precious years with enthusiasm. After the successful completion of courses, the college assists their academic bright students in getting placements to leading corporate houses. 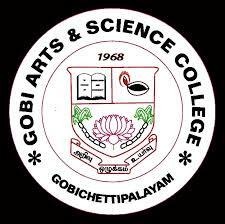 Are you Interested in Gobi Arts & Science College.